It’s kind of amazing how time can just fly by without you realizing it. I really thought that my last post was yesterday, until I realized yesterday was thursday. Time seems to be on a speeding kick with me right now and I’m guessing my brain is now in a more solid state then it was just 2 weeks ago (that was finals week). But it is still amazing how many times I completely just have a melted mind moment where I just can’t think or process anything for a brief second and then I snap back to reality. I think those are some side effects of those pesky finals. Madrona is coming along nicely, just finished chart c and am on chart d, which it seems that these charts are getting easier as I go. That could just be the fumes from the yarn, I think pure silk can do that to a knitter, or anyone for that matter. I’m finding that I really do like working with silk, but there are somethings that I don’t like about it. Now before you go crazy with your double points and other pointy needles, hear me out. The one thing that I don’t like about silk that I wish it had was more give, in the way that wool has. I know that is one of the characteristics of silk, that even though it is an animal fiber, it won’t have the same characteristics as other animal fibers. Regardless I am enjoying knitting with it and the pattern is still engaging. Right now I have some yarn sitting next to me that is slowly speaking to me, telling me what it wants to be. It’s one of those designs that you all will see eventually. I rediscovered it when I pulled out and aired the stash last week. Which I think that was the most popular entry to date, something about mass quantities of yarn makes knitters excited. But on that yarn, it’s telling me what it wants to be, which what it is telling me is kind of compelling. This will be one of many designs that I will get done this summer and get out after that. I’m determined to get these published so that everyone can see what I have had cooking in my mind for months. While the designs brew in my head I have been doing some spinning. I pulled out the wheel again, continuing some of my Spinion spinning (it’s the term my knitting group coined, it’s a spinning minion). I’ll elaborate on that a little bit. One of the knitters I regularly hang out with, refuses to spin, she said she might be tempted to weave sooner then spinning, but spinning isn’t something she wants to do. Because of this and because of there being a few spinners in the knitting group, she will catch us while at fiber events while touching fiber. She’ll say, “that is really pretty, spin that for me and I’ll buy you some fiber.” The spinions were created then, so this is one that I’m spinning for her and it’s gorgeous. It’s some BFL from Pigeonroof Studios, in this really fantastic shades of oranges. I like spinning BFL anyway, so it’s a win win for me too. I get to spin with lovely fiber and the finished yarn doesn’t end up in my stash. And I know that posts with pictures are more fun, I’m still working on getting more photos up here. 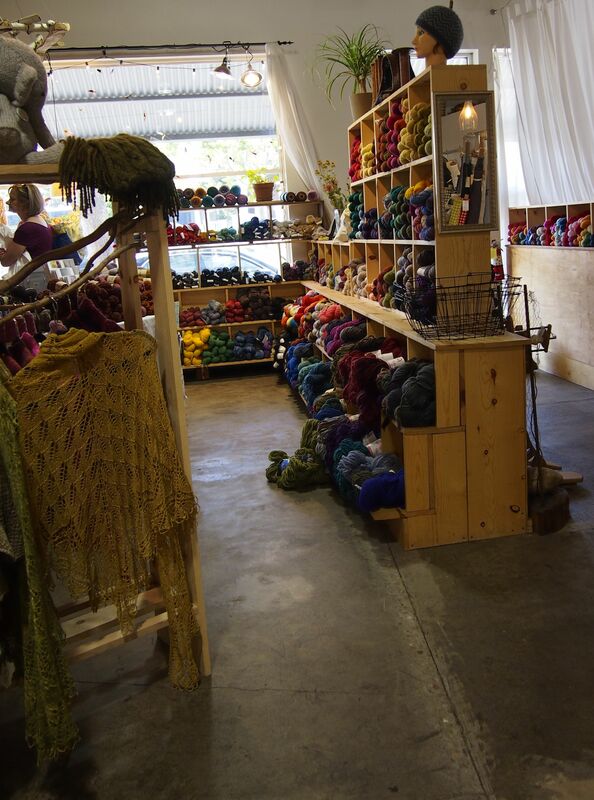 For now I’ll leave you with a picture of A Verb For Keeping Warm, just a small snapshot of the shop and some of it’s amazing yarns. I keep talking about my stash, like it’s some large, invisible entity. It is quite real and I know that I had a lot of yarn, but I didn’t really know it until I took pictures. Keep in mind that I only got between 85-95% of all of my yarn in the pictures. There is still some I didn’t pull out and photograph, but I think that the pictures will speak for themselves. I put them on my twin bed, which you can see that for the most part you can’t even see the comforter anymore. The first picture is just random yarns, Tosh, Sundara, Abstract Fibers, and many others. This includes some sweater quantities in Malabrigo, Tosh, Sundara, Cascade. 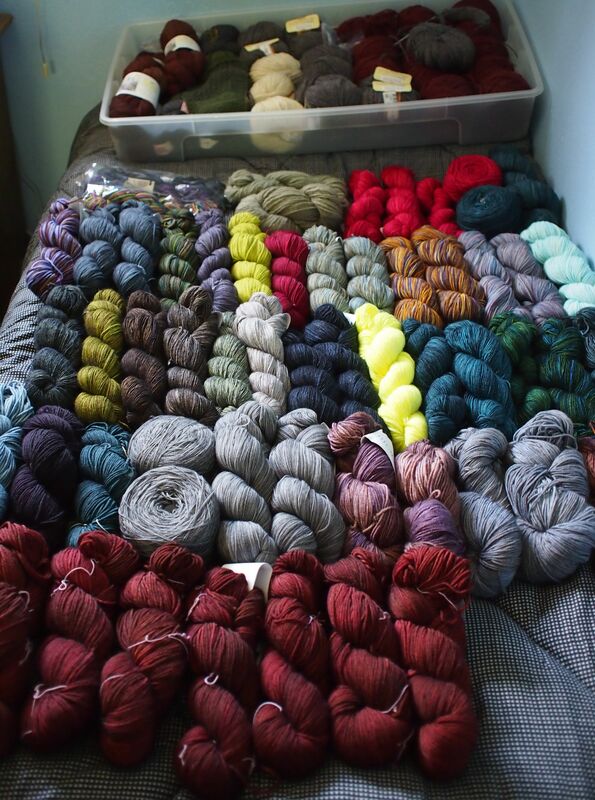 When I saw this I knew I was in trouble, in this picture there is about 140 skeins of yarn alone. Then we go to the next picture, which has one of the two large under-bed storage, the one pictured has at least 4 sweater quantities in it. And then it’s the contents of the Tosh bin, which doesn’t contain all of it. I am still looking at both pictures in awe. 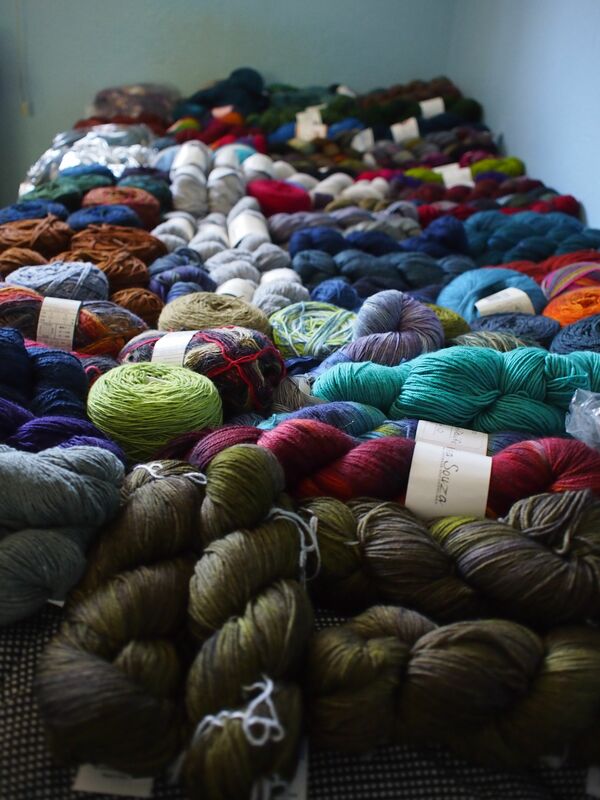 So approximate total of skeins that were photographed today… 300+ easy. This is definitely not SABLE quantity here. However, I am very glad that I started the Social Pressure Experiment. There is way too much good stuff here that it would be insane to get any more yarn before using some of it. There are yarns I’ve had for years in the stash, which I’ve never used the yarn before. I did find some yarn I forgot about, well I knew I had it, but I forgot what the exact colors looked like. Yes I have photos on Ravelry of some of them and the ones in question, but those were with my phone, once I get my lightbox I will redo them. That yarn I found might just have a design in mind, I know I talk about designs but you don’t see that many of them. Trust me I’m working on fixing that. My plan for the summer is to relax, knit a lot, and get some of the designs ready for everyone. In sweater news, I finished the left front last night and now I get to start the right front. Still happy with it and happy with some swatching yarn. Wednesday was the last day of finals, so I am done with the semester. I will have the next 2 months free to knit and do as I please. Yesterday I took to recharge my batteries and get myself ready for the summer ahead. There are some things that I would like to do this summer and places to go see. I had an entire blog written about a cardigan that I swatched for and just began, but that time has past. I’m working on a lovely caridgan, surprise! Its in Loft, which I am finding I love working with. Its worsted cousin, Shelter, is also a favorite of mine. I’m using the color Sweatshirt and am knitting a pattern out of wool people 7, Ivar. I will not be knitting it as long as shown in the pictures, but besides that I’m knitting it to pattern. I have the back done and part of the left front, hopefully this will be done by July. Last Friday I took a trip up to A Verb for Keeping Warm, with some of my knitting friends. The shop has the Wool People 7 trunk show on display, so naturally we all wanted to go up there to see it. When we arrived we saw the trunk show, which is lovely (and convinced 3 out of the 4 of us to get yarn for projects from the collection). I kept toying with the idea of making another Grettir in a green scheme, but then I thought about making another pattern that has a lot of cables. I walked around a bit and thought to myself, picking up yarn and putting it down. We breaked for lunch and the other 3 of the group had already made purchases. 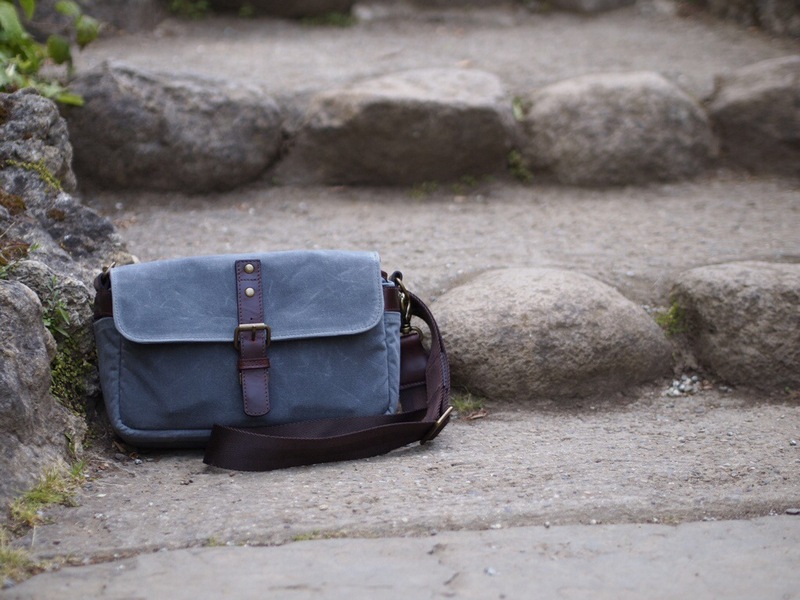 After that I split off to a camera store, which sells a bag company that I have been looking at for a while now. I ended up getting one. If you are wondering it a Ona Bag Bowery, which I got in the smoke color. I took it yesterday to go shooting at one of my favorite local locations. It worked out great, but lets get back on track. I did not buy anything at a Verb which I am still surprised with myself. However I have decided that I can buy a single skein of swatching yarn, as long as I work on it right away. And only 1 skein on swatching yarn a month. Back to knitting on the cardigan, and the shawl, and the socks…. now that I have more time… Which I’m still surprised that I have time again. It’s that time of year again, when the weather gets nice, the flowers come out to try to kill me with their pollen show us their beauty. The days get longer, the nights warmer, and the days become somewhat of a dry inferno. Thankfully so far those days that are really hot are also coupled by a few days of cooler weather. I don’t know about you but I really don’t like hot weather, I generally warm warm like a furnace as just my normal. So having hot weather isn’t something I generally look forward to. Something else that is this time of year is finals, for those who are still in school. They were the reason there was not blog entry last week, I was studying quite a bit for the finals that were happening. They still are not done, I have one more on wednesday. After that I will be free for a little bit at least to do a lot more knitting then I have been able to while in school and working at the same time. For now all I can say is that I am knitting on a cardigan from stash, I will talk about that later in a more complete entry, after my last final is over. But I will say that I am enjoying knitting it immensely. And I will have to talk about the recent trip I took with some of my knitting friends up to a local yarn shop, in which I will have to let you all wait and see if I bought anything there. But for now, making some breakfast with my second cup of mandated coffee. I’ve been told after a cup of coffee I look better, probably because I am definitely not a morning person and I look angry right after waking up. This morning it’s quiet, just the sound of the stove, the typing on my keyboard, and the little peeps from the birds. Mornings like this may make me not hate mornings, if I only had the day off. Soon….very soon…. and I will be knitting and spinning once again!